We understand the need of every private individual and company to feel safe in their premises, and we provide a range of security systems that will make you feel secure. Our intruder alarms are state of the art, and we've constantly got our eye on the latest technology to ensure we keep up to date. Access Security Solutions offer both wired and wireless alarm systems so that the most inaccessible areas of your property can be secured neatly and efficiently. For your alarm installation we can draw on a number of alarm products to meet your requirements and budget. Our most popular for reliability and cost are the Orisec range, the HKC Quantum 70 and Yale SmartHome alarms with secure transmission methods, long battery life and superbly designed detection accessories. Some systems can be expanded to detect not only intrusion but flood, smoke or gas and we canadvise which would be the most suitable for your premises. All systems can include monitoring services at only £14.99 per month. Protect your family with the most advanced intruder alarm technology available. The Orisec range includes an extensive selection of keypads, with choice of finishes to suit any interior, perimeter detectors available in 3 different colours to suit your property and key fobs to allow you to remotely set/unset your alarm system. They can also be used to open and close garage doors/gates, trigger panic alarms switch lights on and off and more. You can also remotely control your home security system via your smart phone, with the Control plus and Control Lite Apps. Designed to offer full flexibility dependent on your requirements. Every Orisec product is designed and manufactured in the UK. 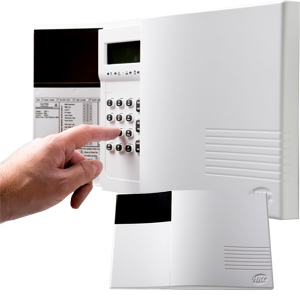 This alarm is one of the best systems available on the market. It's ideal for residential and small commercial properties, as it's reliable and excellent value for money. The Quantum 70 is an aesthetically pleasing, fully integrated, wireless control panel offering peace of mind and excellent value for money. Quantum comes with a range of intrusion devices that detect attempted or actual intrusion using secure two way technology. The Quantum is optimised to use SecureComm, HKC’s cloud based communication service. By downloading the HKC App this will enable users to remotely control their security system including arming/disarming, retrieving logs, issuing commands and receiving notifications and alarm messages (both text & audio) from the System. 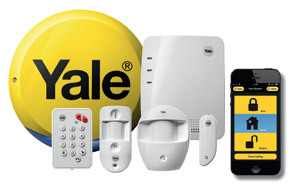 You can now remotely arm and disarm your home’s system via your smartphone, when used in conjunction with Yale’s top-of-the-range Easy Fit SmartPhone Alarm, as well as receiving images captured on the wall-mounted PIR device, delivered seconds after the alarm is triggered. 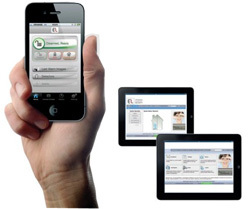 Our wireless alarm systems can be expanded to enable monitoring and control on computers via the internet as well as from smart phones, compatible with iPad, iPod, iPhone and Android systems. "The work was efficiently done and Dean spent a lot of time with us showing us how to download the system on our phones and explained all the workings of the device to us"
"Dean installed our Yale Smart Security Alarm system throughout our house, both indoors and outside. He arrived exactly on time and informed us when he was on his way. He was very courteous and polite. He ran through some questions to start with asking us where we would like everything positioned and he then made some alternative suggestions to better positioning. Installation was then done and then he ran through everything with us and explained how the APP worked and we tested everything with him before he left. We were very happy with his visit"
"Dean installed the security alarm for us, he came on time, did the job perfectly and explained very clearly how to operate the alarm both manually and using mobile app. I would recommend Dean to all my friends. Thanks"
"Dean completed the tasks with faultless efficiency and professionalism. Have already booked him in for the next service"
"I strongly recommend Dean without reservation, as a professional and reliable individual who performed to a high standard of work"